I was brainstorming ice cream flavor ideas and I glanced at my Homemade Rainbow Sprinkles sitting in an adorable little mason jar. I needed to use it. When “Cake Batter” popped into my head my eyes shot wide open and I stuck my ice cream machine bowl in the freezer. 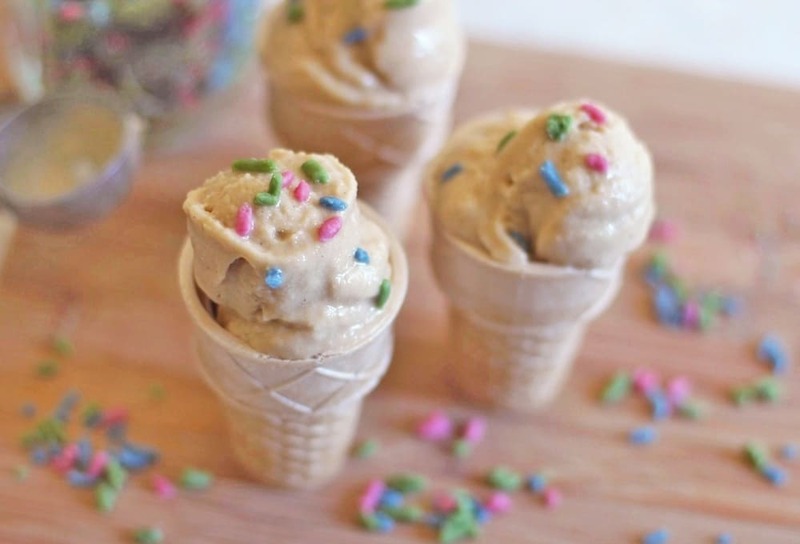 This healthy Cake Batter Ice Cream is incredibly flavorful, soft and smooth. The flavor was just like cake batter: vanilla-y and buttery and sweet! But this ice cream recipe is better than any other ice cream you would find because it doesn’t contain heavy cream, egg yolks, high fructose corn syrup, refined sugar, artificial flavorings and artificial colorings. 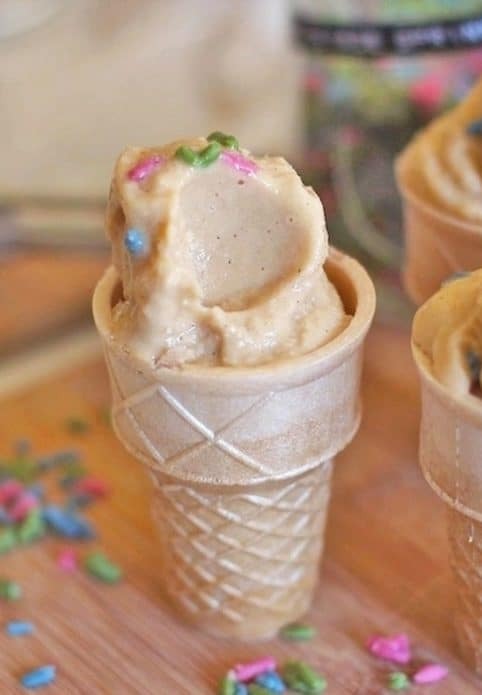 This healthy Cake Batter Ice Cream recipe is low in fat, low in sugar, eggless, high protein and vegan (but you would never know it)! Can't choose between ice cream or cake? 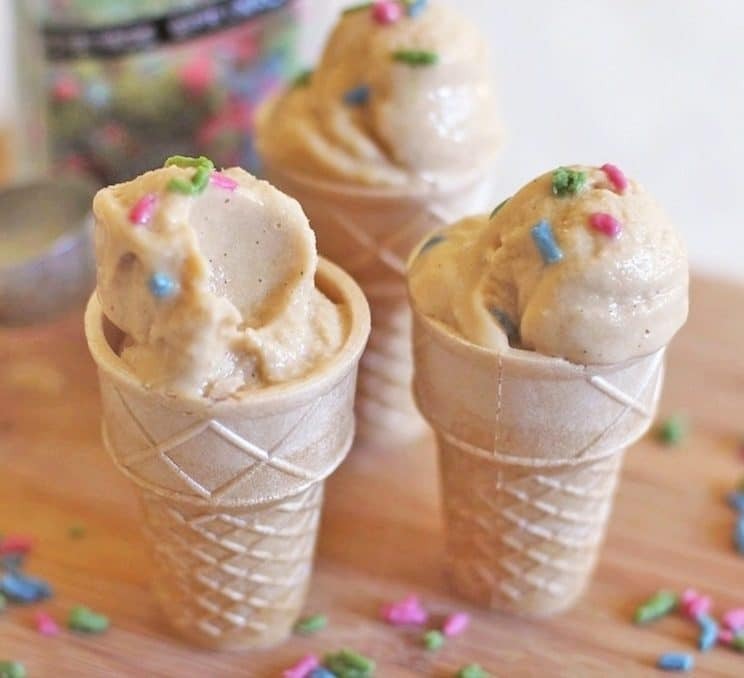 Have BOTH with this healthy Cake Batter Ice Cream recipe! It's low fat, sugar free, high protein, and vegan! In a blender, add the almond milk, vegetable glycerine, vodka, vanilla paste, stevia extract, almond flavor, and butter flavor. Blend until smooth. In a small bowl, whisk together the protein powder, starch, xanthan gum, baking soda, and salt. With the blender running, slowly add in the dry ingredients. Blend until smooth. 2) Any ideas for us who don’t have ice-cream makers? 1) The glycerine is a natural sweetener that creates a smooth texture and helps the ice cream stay soft, even when frozen. I love your mini ice cream series! It’s been 100° in my town for the past two days, and it’s practically impossible to go outside until after 8 pm at night. Eating ice cream would definitely help with this heatwave! Aw! Your blog is so cute. I love the idea of it. And these look fabulous! I wish I had all of the ingredients on hand now. If I did, I would be in my kitchen making it! Can you use whey powder instead of the brown rice? Please correct me if I’m wrong, but, aren’t flavored vodkas not “safe”? I was told that vodka neat is ok, but when the flavors are added, they could contain gluten. Thanks! I am yet to come across a bad tasting recipe belonging to you. Keep them coming, you’ve got an amazing future ahead of you. 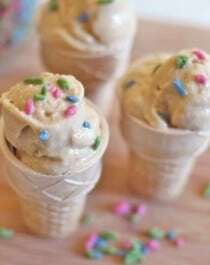 Please design a recipe for Gluten free ice cream cones!! Ireland has terrible Coeliac stuff 🙁 it’s a horrible disease to have here!! Totally didn’t think this would work… so you can imagine my surprise at how wonderfully it turned out. I did indeed help myself to a second, third, and fourth serving! Beware of the smell if you do buy it! The Cinnabon vodka has a *really* strong “vanilla crème” smell (like cinnamon bun frosting x10). I should have also commented: I followed the recipe nearly to a T, with the exception of the vodka and I used vanilla whey protein powder. Still excellent. I will be making it again! Yep, this has got to be one of the greatest things I’ve ever made. So, so tasty! Thank you so much! 🙂 Perfectly rich! Is the vodka completely necessary/are there any substitutes you know of?